Granted at this point Jim and I have a little more than one month’s experience on the road, but it doesn’t take a sociologist with a Ph.D. to analyze the difference between life in an rv resort and life in state parks and what it is says about the inhabitants of each. Of course, as with any generalization, there will be exceptions, but overall this seems to be true. RV resorts almost always have full hook ups. A full hook up means water, electric and sewage. A full hook up means that you truly have all of the comforts of home. No rationing of water, all the electricity you could want and you don’t have to watch the contents of either the grey or black tanks. Dumping is as easy as flipping a switch. RV resorts are primarily the domain of the big Class A’s and Fifth Wheels. These big rigs are designed for supplying all the comforts of home. They sport big screen tv’s, comfy reclining chairs, faux fire places, full-fledged kitchens and heaven knows what else. They can be very large with popouts for extra space. They are also somewhat cumbersome to drive and are best designed for staying in place rather than ranging wide and far. There are lots of permanent inhabitants in rv resorts. It is easy to tell them by the elaborate set ups on their site including little gardens, fences and we’ve even seen bubbling water fountains. Even without these custom environs, a permanent or semi-permanent inhabitant can be recognized by their wheel covers. They have no plans to go anywhere in the near term. RV resorts are communities. Because they have longer term inhabitants, rv resorts offer a calendar of events. There is the weekly free donut and coffee breakfast. They usually have a bingo night. They often offer exercise classes and group walks. Some have quilting groups which meet weekly and other special interest groups. And, because it is a community of people, there is usually a board and group meetings where grievances are aired and issues discussed. Dog poop is pretty much always a hot topic. All of this can be very nice if community is what you are looking for. So, you can think of camping choices on a continuum. Full hook ups are the apex of camping civilization. At lower cost rv parks and in most of the state parks, there is the next tier of camping civilization and that is partial hook ups. A partial hook up eliminates the sewer hook up and leaves the camper with water and electric and the need to monitor both the grey and black tanks. There is pretty much always a dump station on hand at no cost, but getting to that dump station means going through the entire process of hooking up and un-hooking. This is pretty much every step involved in getting ready to leave for the next destination so you don’t really want to have to do that until you do plan to leave. Of course, you can find plenty of Class A’s and Fifth wheels in state parks. But you can’t find them in all state parks. Parks with smaller campgrounds, dense vegetation or simply smaller sites will have length restrictions. If you’re looking to commune with nature, then a big rig is a definite liability. On the far end of the communing with nature continuum is boondocking. Boondocking is the camping equivalent of living off the grid. Boondocking lets you camp on government land, by the side of a pretty stream or in the middle of a vast plain. Boondocking means you’ve still got your comfy bed, but you have the added entertainment of trying to manage your fresh water, power and tank levels to stay as long as you can. Can you make it five days? Seven? More? One blogger I follow boasted of going 12 days and elucidated the somewhat extreme measures they went to. A brand new competition–extreme boondocking. It might get a bit ripe. Not to stray too much off topic, but there is one other kind of boondocking and it has nothing to do with nature. That is the overnight in a parking lot. Many Walmarts and Cracker Barrels will let you overnight in their parking lots—it helps if you shop or eat there, too. We have yet to engage in this behavior, but there are many who do. 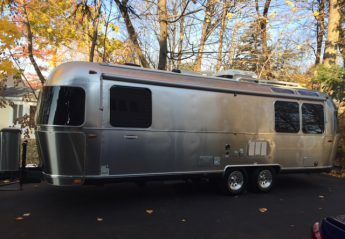 We think we’ve hit the sweet spot with our 27-foot Airstream. We have plenty of creature comforts. With some careful choreography, the three of us can move around inside just fine. The big rigs tower over us, but we’re pretty agile and there are few parks where we can’t go. We have no desire for the confines of community. A full hookup is nice, but we’re down with conserving tank capacity. A night or two in a rv resort is fine for some civilization, but given a choice, we’ll take a park and a partial any day. So, the partial hook up is fine by me, but one realization I have come to is that I really miss wifi and a decent cell connection. I can give up a shower and I can wash dishes with a scant amount of water, but after a couple days with no wifi or cell service, I wilt like a hot house flower. I need connectivity. Connectivity extends to reasonable television reception. I am completely addicted to watching the local news. It is a reflection of what people in a given area care about, how they view the world and how they express themselves. Local anchors do not conform to major market requirements for cosmetic sophistication. They often exceed the average age, weight and lack the grooming requirements of a big city anchor. But what they might lack in aesthetics, they more than compensate for in a feel for their town. We’ve watched local anchors editorialize to their communities. We’ve watched with amusement and some respect as these anchors have admonished and chastised their communities. You wouldn’t catch Lester Holt doing this, but it says something about the value and relationship of the news cast when someone knows you and can tell you where its really at.